Heralding the arrival of the forthcoming Discover 200 album mixed by Para X is this taster release featuring 2 of the tunes from the album, an original from Para X and a superb remix of the Para X classic Magical Soundwave from Cenk Basaran. Para X's original - Apocalipsis is another stunner from this prolific producer with bags of melodic content and top notch production quality. Cenk Basarans remix more than holds its own on this strong package and shows just why A Listers such as Paul van Dyk hold him in such high regard. 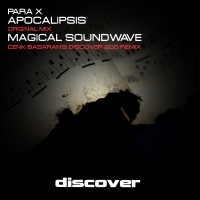 'Apocalipsis / Magical Soundwave' is available now from Beatport and iTunes.